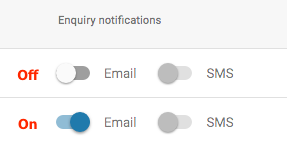 How do I change the recipient of enquiry notifications for my venue? New function manager or event planner? Find out how to receive Venuemob enquiry notifications. To change the enquiry contact for your venue, firstly login to Venuemob Manager. Once logged in, navigate to Settings > Staff, found on the left hand side of the page. You can assign as many enquiry contacts as you'd like for each venue. You can make an existing staff member an enquiry by clicking on the email toggle button. This person will now receive an email notification when a customer submits an enquiry. If you want to make someone not in the staff list an enquiry contact, you will have to add them as a staff member. Click on Add to invite a new staff member. Enter their name, email address and phone number. They'll receive an email notification prompting them to set a password and log in, but you can assign them as an enquiry contact before they do that.